“Small” enough to care “Big” enough to cope. We fully refurbished our wig studio in 2008. We now have more room, better lighting and 100s in stock! Appointments are in our private fitting room, bring a family friend, relative or 2! A second opinion always helps. We then gently guide you through the vast range of styles available, suiting the wig your needs and matching the style you presently have if that’s what you would like. We are passionate about what we do, we are a one stop shop, advising you what to expect, when to expect it and how to deal with it. 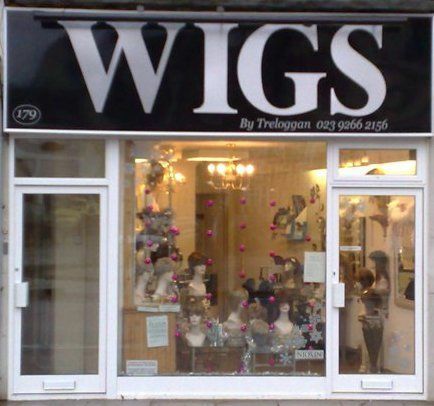 We know all about wigs so you don’t have to! Many times Natalie has been likened to the wizard in “Harry Potter” the correct wig is chosen for the wearer! Our knowledge, patience and end result in the customers’ satisfaction has bought us on-going national recognition in both Private & N.H.S Hospitals. Bringing people to our shop for a fitting in a private room or our online service is sought. Treloggan is an NHS approved supplier of wigs. A Members of the Hairdressing & Beauty suppliers association. Natalie is a City & Guilds qualified hairdresser trained at Chichester college of Technology, whilst working at an apprenticeship at Village Hair craft salon, in Westbourne. Having completed a precision cutting diploma with “The Trevor Mitchell school, Natalie went on to complete a “Clynol “colouring course. Treloggan wigs is a Trevor Sorbie – My New Hair approved salon, having attended a Macmillan nurse led course in the effects of Chemotherapy. Natalie has received technical training in Custom made prosthesis & hair replacement, Vital hair and New Women integration. Having attended training courses both in the U.K and U.S.A Natalie is always up to date on the latest styles, constructions and sizes of wigs, so they can be both realistic and comfortable with security. 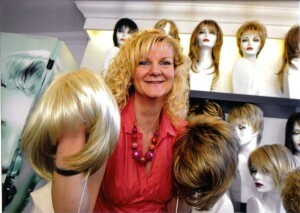 Treloggan has many loyal and proud customers, returning for new replacement wigs and pieces time after time. Having worked with wigs for 30 years, Natalie is very skilled at her job, finding the correct image for her customers needs. A sympathetic, but reassuring knowledgeable approach puts the customers at ease.